Brioche is a very dense, rich and sweet bread. The recipe i have from Artisan Bread in 5 Minutes a Day uses less sugar than what i like. BUT, thats ok. It is still a wonderful and amazing bread. Its so dense, that it sinks in water.. no joke. Makes four 1 pound loaf. The recipe is easily doubled or halved. 1 1/2 cup unsalted butter ( 3 sticks), melted, plus extra butter for greasing the pan. 1. Mix the yeast, salt eggs, honey, and melted butter with the water in a 5-quart bowl. 2. Mix in the flour without kneading, using a spoon. If you are not using a machine, you may need to use wet hands to incorporate the last bit of flour. The dough will be loose but will firm up when chilled, don't try to work with it before chilling. 5. Defrost the dough overnight in the fridge if frozen. On baking day grease 9 x 4 x 3 inch nonstick loafpan. Dust the surface of the refrigerated dough with flour and and cut off a 1 pound piece (grapefruit size) (Again, I find it easier to dust hands and work surface so you don’t overflour leftover dough). Dust the piece with more flour and quickly shape into a ball by stretching the surface of the dough around to the bottom on all sides, rotating the ball a quarter turn as you go. 8. Using a pastry brush, brush the top crust with egg wash.
9. 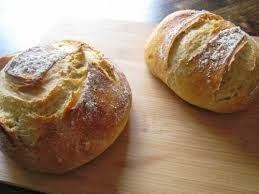 Place the bread near the center of the oven and bake for 35 to 40 minutes, or until a medium golden brown. Due to the fat in the dough, brioche will not form a hard crackling crust.